Very small pendular steered suspension. 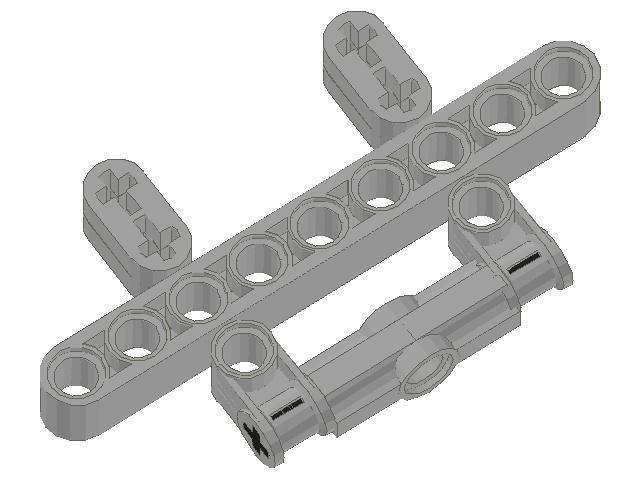 Dimensions are 9x5x5 studs, it can use various gear ratios and transfer the steering further to another suspension module. Step-by-step instruction provided. Designed as the front suspension for small car models, but durable enough to work in the bigger ones. 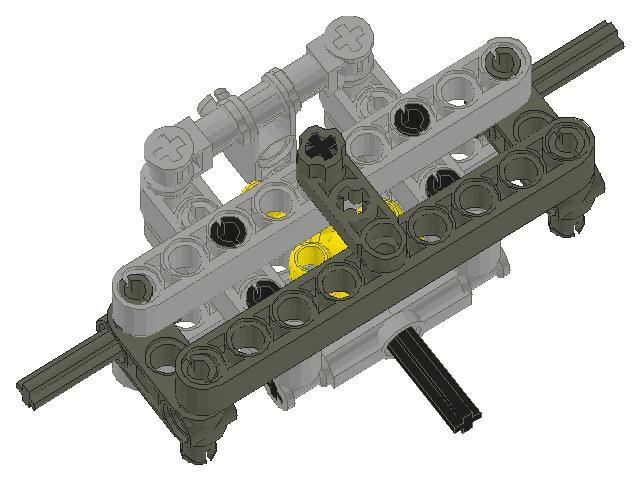 It’s a very simple construction, that consists of 36 parts, all commonly available, and can be widened, if needed. 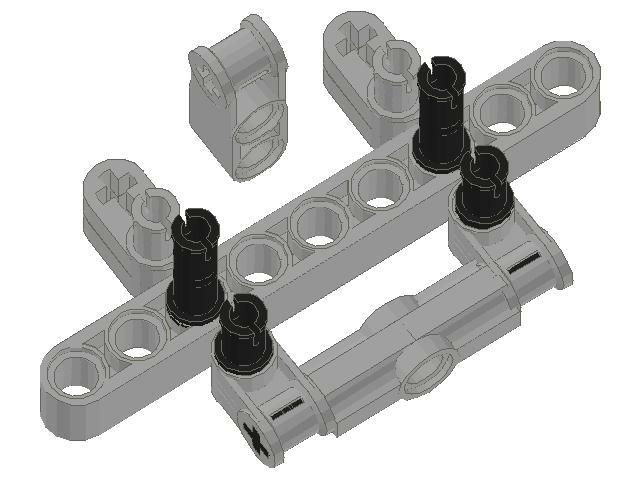 A great advantage of this design is the possibility to transfer the steering from the front or back of it, or even from both sides – in this case we can use several modules and transfer the steering through them, from one to another. Knob wheels can be obviously replaced with bevel gears, and thus several different gear ratios can be obtained inside the module. It may be problematic, however, to add shock absorbers to this suspension. 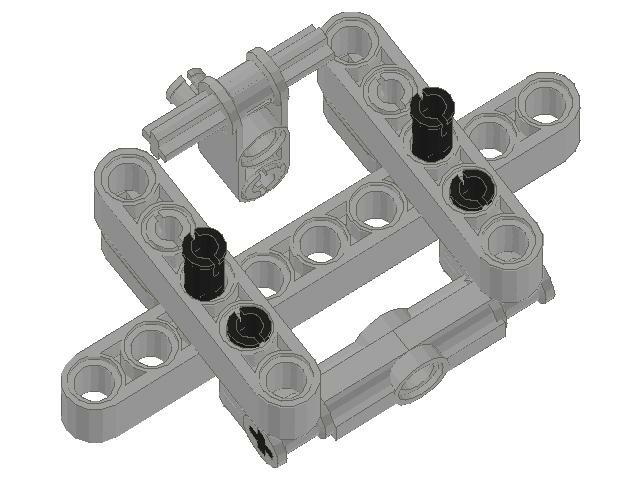 They can be surely attached to transverse liftarms, but only with suspension wider than 9 studs. As for me, if a model is small enough to require only a 9-studs-wide suspension, it probably has no space for shock absorbers anyway. Oh! 16 to keep the spacing of one beam.I haven’t noticed that diference between regular and double beveled gears. Thanks for the solution! It works with any number of teeth per gear. You can add two 16t gears between this axle and Servo motor to get the alignment you want. It seems one can’t use this system with a servo motor because the motor axle is rotated 45° and cannot fit in the motor. That is,it can fit but it can’t function for steering. There are two axles from two knob wheels and their profiles can’t both be perpendicular to the beams and they need to be. It is clearly visible from photos 10 and 11. With gears, the situation is better, but there is still an offset of few degrees so it’s not really centered. The same goes for “…suspension with Ackermann steering geometry”. I have had an idea about how to use this construction and save vertical space: would it be possible to use long torsion bars (like the ones used in your Tank Models for suspension) to stabilize it? Thanks in advance! It’s shown in the photos. The 3 first ones explain how it works and the other pictures are the building instructions, albeit without numbers, etc. The same as to a studfull one: put pin and axle from the suspension through pin holes in the chassis. 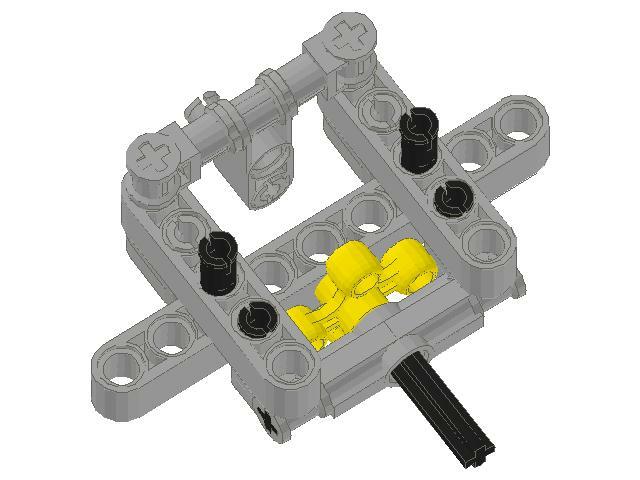 I have built this with the return to center steering as I am build a studless Technic R/C car. How would you mount this to a studless chassis? 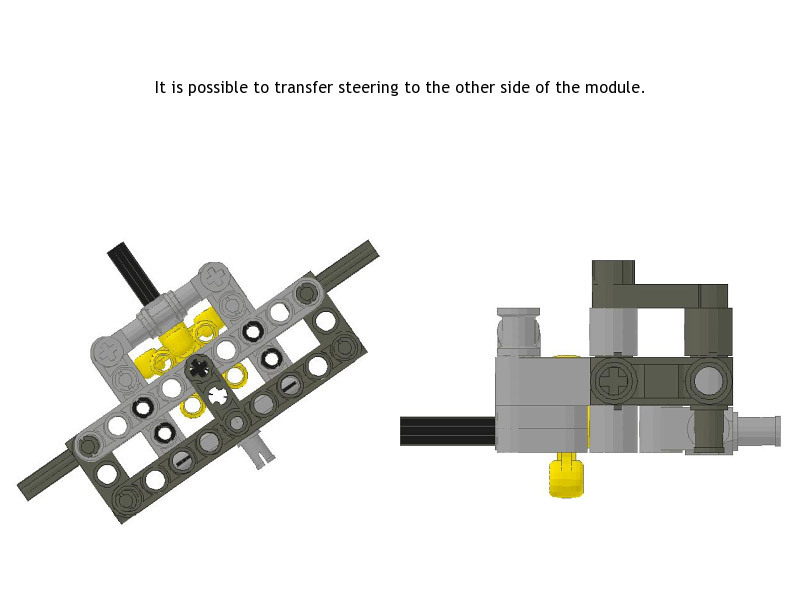 Seriously, look at the instruction – all the parts are shown there. There’s like a handful of them, I’m sure you can manage. no i just wondered, can you give me a parts list. No, of course not. You mistake me for Santa Claus. can you get me parts and send them to me? Try adding shock absorbers to stabilize it. oh and one more thing. if a differential is one stud to the side, will it affect the performance of the vehicle? ok thanks. sorry if i can be annoying, but everything ive seen on this website so far has helped me heaps. No, there’s no space for it. You just said you don’t want to include it. but how will i include a differential into it? Sure, you can use knob wheels instead. ive been trying to incorporate this and your 4 speed linear gearbox into a model that im working on. how can i make a driven pendular suspension for the rear wheels without having to use one of the new bevel gear differentials? could you please just post a photo of where to put the suspension for noobs like me? I play and drive around my LEGO models. And return-to-center steering only makes it harder. oh ok. i suppose this was suppose to be for those who play and drive around their lego models. aka me and thank you for your ideas and creations they really helped me. I never ever felt a need for return-to-center steering. It only makes things harder and unrealistic. ummmmm, just wondering, have you seen this video before? Can you please post the instructions for the return-to-center steering system. i mean i’ll be building it with this steering…. yes….. oh i ge it now, thanks, and i was wondering if you could do me another favour…. i’m gonna be building a monster truck with this chasis, its gonna be very small, and will not have any pf at all, so what kind of chasis do you suggest? You know there are Technic bricks and beams with holes in them, don’t you? Um… let me ask it in a different way…. am i supposed to attach the circular stud pointing out to the chasis? Or better, yet, how would you attach it to a chasis? 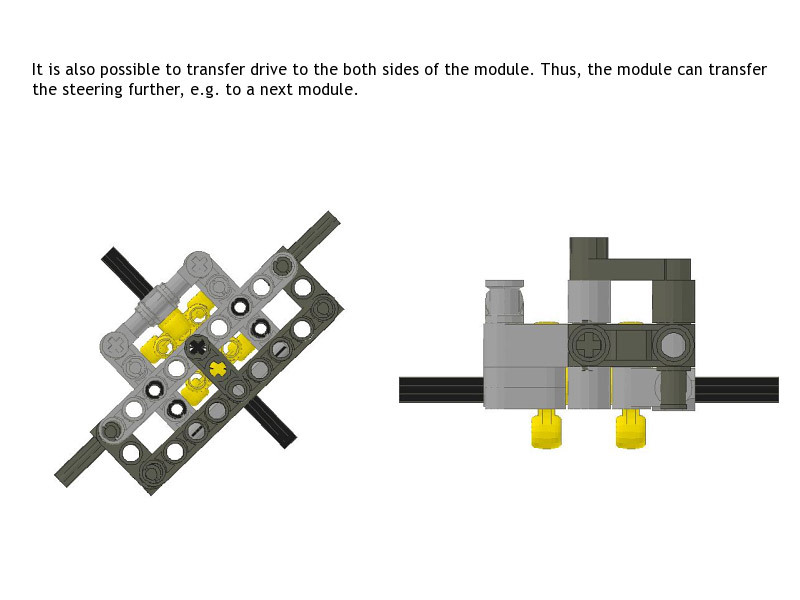 Hi, i’m kind of a noob at using lego technic parts, and i was kind of wondering, how can i attach this system to a chasis? It would be much easier for me if you do tell me. Thanks! 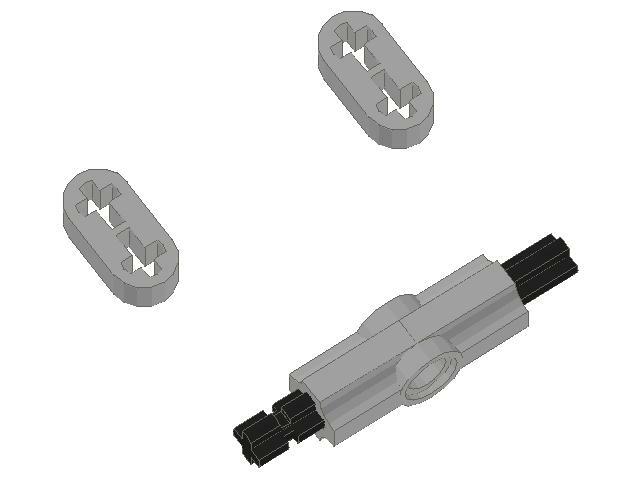 You don’t need these to be of even width to combine them with studded parts. I’m combining these all the time. Of course. And it would help if your question was a bit more grammatically correct. 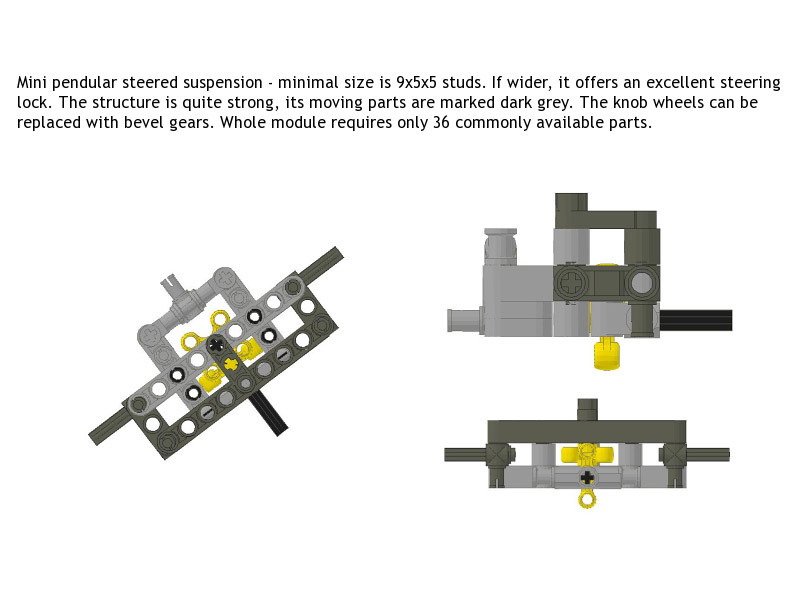 This Steered Suspension is very similar to the one used in 8261 Rally Truck. Were you involved in the creation of this LEGO model or did it influence your creation? Or is it just a coincidence? Depends on what you want to do with the car. This suspension is fine to drive around the room on the floor or on some simple obstacles. But if you want to take your car outdoors and go off-road, an independent suspension with shock absorption would be a better choice. would you recommend this for a rc car or would you recommend something else. I’ve built plenty of buggies already. Why don’t you pick one and see how it’s made? i made it but do you know how i could add a motor to the steering. The instruction is right here. which steering mechanism works the best for a rc buggy. could you please put the instructions on because i am trying to maake a rc buggy but i have no idea what to use for the steering. please upload an instruction of the gear mechanism that engages to return to the center, when the motor is turned off.very great work! Best not to place them. You can use it without shock absorbers if there is another axle in your vehicle that provides stability. So where to place shock absorbers? i know an easy way to attach shock absorbers. I didn’t take pictures, because I thought it’s obvious. Where do you attach the suspension pieces? Can you show pictures? I’m searching/trying to create a “better” (more robust and precise) steering for robotics with Mindstorms than the rack&pinion. 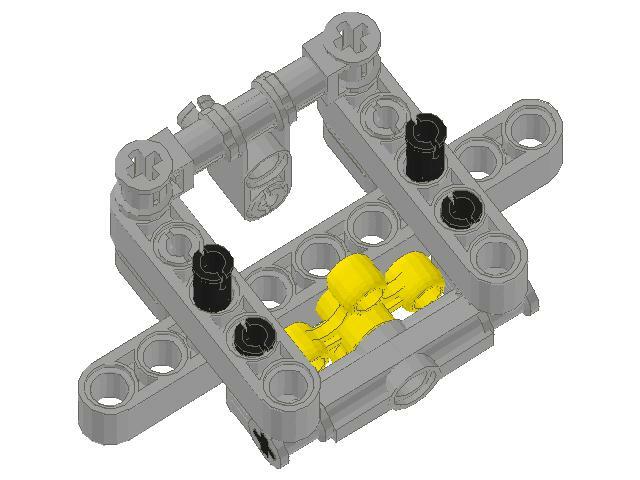 I’m looking and your creations and at “Telescopic Handler 8295” instructions. Nope, I have used this one in my Morgan for the first time. 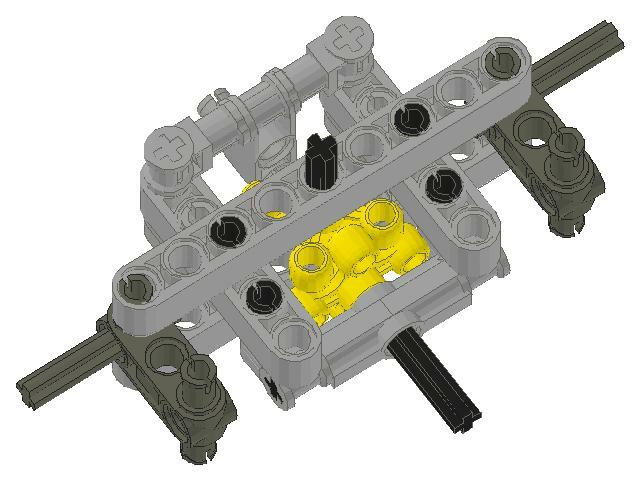 Is this steered suspension the one you used at your November Forklift PF?